Waiting on Wednesday' is a weekly event hosted by Jill at Breaking the Spine, that spotlights upcoming releases that we're eagerly anticipating. 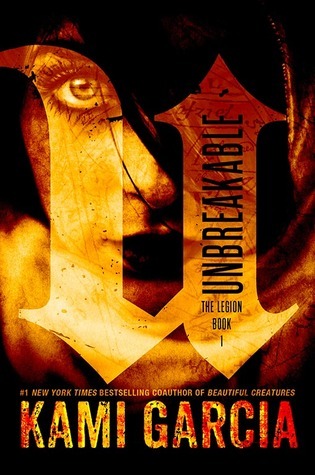 This week, the book I'm waiting on is Unbreakable by Kami Garcia. I am a huge fan of the Beautiful Creatures series, and I was hugely disappointed when I turned out not to like Icons by Margaret Stohl, one of the two co-authors of the series. I guess this means I've got even higher expectations for Unbreakable, as I know the series was written fantastically, and I guess I'm holding out for Garcia to produce an equally-amazing novel. So far, the synopsis promises that it will be amazing, and I am so incredibly excited for the end result! Garcia has my fingers crossed tight with anticipation. So what book are you waiting on this week? Leave a comment below, and don't forget to enter the 2-year blogaversary giveaway! I have never read anything by Ms. Garcia, but I am interested in this book! Unfortunately, I got rejected on Edelweiss. But I hope you enjoy this book when you get to read it! Icons has been a disappointment all around, it seems, but I'm curious to see how Garcia will do on her own. This wasn't even on my radar until now, so thank you! This definitely looks interesting! Thank you for sharing and stopping by our WoW! Nice! Been hearing about this one! Hope you enjoy it! I've yet to read the Beautiful Creatures series but Unbreakable sounds very interesting, too and I've also read a lot of negative reviews about Icons. I really like that cover, it's super creepy. Great pick! Great pick! I'm really excited for this one as well because I'm a huge Beautiful Creatures fan also. I'm definitely looking forward to reading it!